this dreary winter weather is getting us down. we're dreaming of warmer temperatures and longing for tropical weather. since it doesn't seem to show signs of turning tropical any time soon, we decided to make a tropical breakfast to cheer us up. when i think of tropical getaways, coconuts always come to mind. 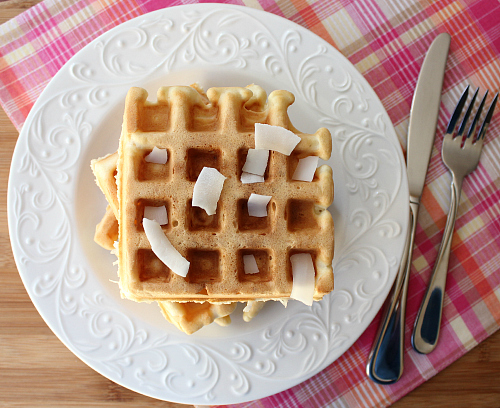 we absolutely loved the coconut pancakes we made a few weeks ago, so we were excited to make some coconut waffles. they were just as good as the pancakes, and the perfect thing to get us out of our winter funk. this recipe made several waffles, so we had some left over. we stored them in ziploc bags and then kept them in the freezer. all you have to do it put them in the toaster to reheat them when you are ready to eat them again. super easy! 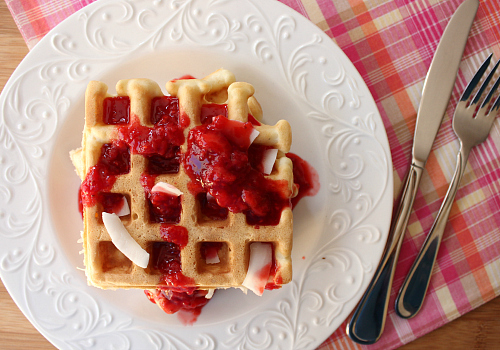 we covered our coconut waffles in homemade strawberry syrup. (i just cooked some frozen strawberries in a saucepan with a little bit of sugar and water until they reduced into a syrup.) such a yummy combination! preheat your waffle iron according to the manufacturer's instructions. in a bowl, sift together the flour, cornstarch, and sugar. set aside. in a separate bowl, whisk together the coconut milk, eggs, and oil. add the wet ingredients to the dry ingredients and stir just until combined. fold in the shredded coconut. pour enough batter into the waffle iron to just barely cover the waffle grid (usually about 1/2 cup of batter per waffle). cook for 4-5 minutes, or until the waffles are golden brown. once cooked, transfer the waffles to a baking sheet and keep them in a warm oven while you prepare the remaining waffles. top with roasted coconut chips or additional shredded coconut. serve warm with maple syrup and/or fruit. Love coconut, will try that recipe. Give a tip on how to make self-rising flour. It is easy and keeps. The salt content is a lot less if you make your own.